Garlic can be very easy to grow. It is easy and requires very little effort when you give it all the right conditions. But if you don't give it what it needs, it performs poorly and is frustrating. 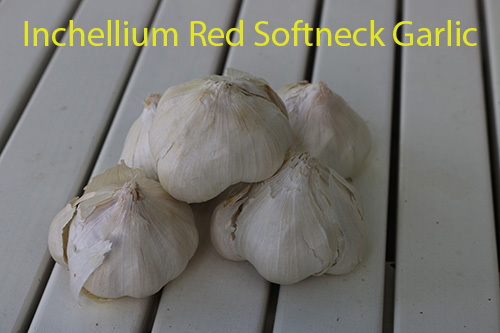 There are two basic types of garlic, hardneck and softneck. 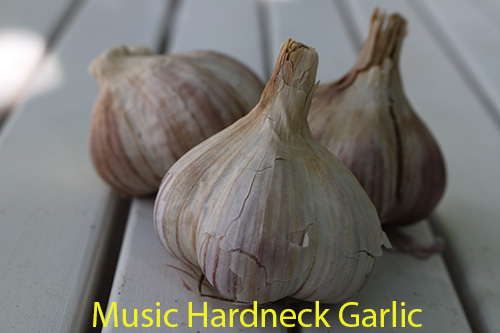 As the name implies, hardneck garlic has a hard stalk in the center of the bulb and up through the neck and softneck does not. Hardneck garlic produces a scape on the top of this hard stalk. The scape is the flower of the garlic plant. It is a delicacy and can be harvested and eaten when it first forms. It almost looks like a goose neck curling on the top of the garlic. Removing the scape improves your garlic harvest, so even if you don't want to eat it (and why wouldn't you? ), it is best to remove them once they form. Softneck garlics do not produce a scape and don't have this hard stalk in the center of the bulb. Because of this, the neck is soft and flexible and allows you to braid your garlic. Garlic is a fall planted vegetable. It isn't started from a seed, but from the cloves of last year's crop. This makes it a clone of the original garlic strain. Each clove, when planted, will produce a full head of garlic the following year. Garlic also does best in cooler climates that have a good freeze in the winter or at the very least a month or two of cool temperatures. Hard neck garlic almost requires this to form a good bulb. Softnecks are more forgiving and do better in warmer climates. Garlic is planted in the fall before the ground freezes. You don't want to plant the garlic too soon because then it will sprout and begin growing in the fall. You want the garlic to be dormant until spring. If it does come up in the fall, it isn't a lost cause. I have had it sprout in the fall and do just fine in the spring. This past year it sprouted in the fall and greened up at least once during a thaw in the winter. We had a good crop of large heads despite this. Garlic is a heavy feeder. This means you need to have a lot of fertilizer in the soil for it to perform well. I like to add some composted animal manure every year before planting the garlic. If you don't give it enough nutrients, it won't produce a large bulb but instead will produce a small bulb with tiny cloves. To plant the garlic, just separate the bulb into cloves and plant the cloves. If you have really good soil that is well fertilized, you can plant your garlic close together. If you don't have the best soil, it is best to space them out more so they have more nutrients available to them. A dense planting will have garlic 4-5 inches apart, while a looser planting will space the garlic from 6-8 inches. Each clove is planted with the pointy end up and the base down. I usually plant mine such that the top of the clove is about an inch below the surface. 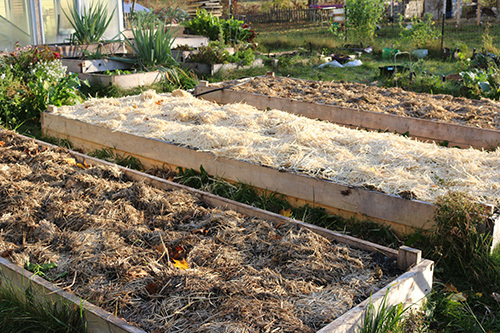 After planting the garlic, I like to cover the bed in 3-6 inches of straw mulch. The mulch serves several purposes. First, it helps keep the soil a more even temperature throughout the cold months. It keeps it warmer when temperatures are really cold and it keeps it cooler when the temperatures swing around and get too warm. It is kind of like tucking your garlic in bed under a nice blanket. Second, it suppresses weeds in the spring. The garlic will come up through the mulch in the spring, but the weeds will have a tough time growing through the mulch. I haven't had to weed my garlic beds when the mulch is deep enough. It makes for a very easy crop to tend. Just plant it, cover it, and then leave it alone. Finally, the mulch helps keep in moisture throughout the growing season. You don't have to water as much because the water doesn't evaporate from the soil surface. The only thing I've had to do to tend the garlic the following spring and summer is to make sure it is watered. Because of the deep mulch, it isn't necessary to water daily. It depends on your climate, but I usually only water once a week if it doesn't rain. Just check the soil under the mulch to see if it is still damp. It is time to harvest your garlic once a few of the outer leaves turn yellow and begin to die back. Just gently dig up the bulbs. You can eat the garlic at this time, but you'll want to dry it for long term storage. Just place the garlic in a dry place for a month or so. Then it's just trimming the tops and some of the roots and rubbing off the dirt and bagging them in a mesh bag. If you want to braid your softneck garlic, don't trim the tops, but braid them and hang them for storage.